Profits take a step backward as the beer giant ramps up investments into promising growth initiatives. Constellation Brands (NYSE:STZ) this week kicked off what's likely to be an important fiscal year for the alcoholic beverage giant. It launched major additions to its beer portfolio in the most recent quarter and sharply increased marketing investments to support that brand along with its other premium beer, wine, and spirits franchises. The extra spending contributed to weaker earnings than investors have been used to seeing from the company, but Constellation Brands stayed on track to meet or modestly exceed management's full-year sales and profit targets. Revenue trends met expectations despite a slight drop on the spirits and wine side of the business. Core earnings posted a rare decline, meanwhile, as Constellation Brands boosted its marketing spending. Beer sales jumped 11% to roughly keep pace with the latest few quarters. The gains translated into market share gains as key franchises like Corona and Modelo performed well during the Cinco de Mayo and Memorial Day holidays. The new Corona Premier and Corona Familiar brands are off to a strong start, too, with the national rollout showing quick market share gains. Operating margin dropped 2.3 percentage points in the beer segment, to 38% of sales, due to planned spending in marketing and advertising. The wine and spirits segment posted a slight sales decline, and profit margin dropped to 25% of sales from 29.3% of sales thanks to higher grape costs and increased marketing spending. On an adjusted basis, core earnings dropped 5% as increased spending more than offset the benefit of higher prices in the beer portfolio. Constellation Brands generated $504 million of operating cash flow, up 36%, as free cash flow doubled to $336 million. Executives said the sales pace met their targets while the earnings decline simply reflects investments in attractive growth initiatives. "We expect these investments to yield excellent returns well into the future," CEO Rob Sands explained in a press release. "I am especially pleased," Sands continued, "with the successful execution and momentum of our new product introductions, including Corona Premier and Familiar." At the same time, CFO David Klein explained, the company's finances continue to improve. "The strong operating cash flow we delivered enabled flexibility for venture and growth investments, as well as continued share repurchases and debt repayment," he said. Management affirmed their 2019 sales and profitability outlook, and they continue to expect the beer business to expand revenue and profits by around 9%, while the wine and spirits segment boosts both metrics at a 3% pace. Those forecasts imply no overall profitability gain for the year, which would mark a departure from the recent past. After all, surging profit margins have allowed Constellation Brands to increase per-share earnings by 20% or more in each of the past five fiscal years. 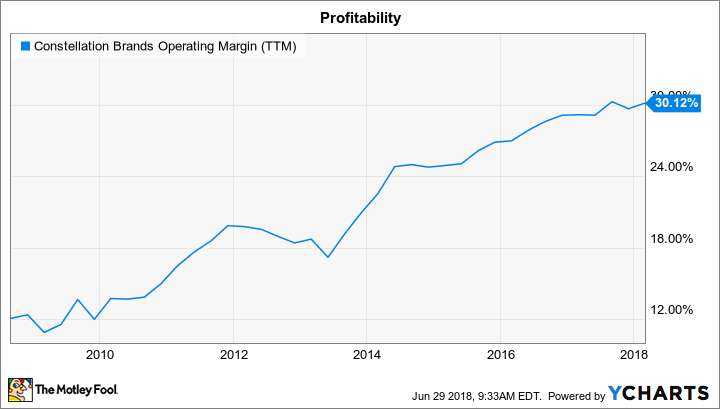 STZ Operating Margin (TTM) data by YCharts. The latest outlook calls for that pace to fall to 10% in fiscal 2019 as operating margin stands still. But investors are hoping the increased spending on branding and capacity expansion projects will lay the foundation for improving results for many more years. In the meantime, the more modest earnings growth in 2019 will be supplemented by free cash flow that's expected to jump to as high as $2.55 billion from $1.9 billion in 2018 and $874 million in 2017.